In honour of the Offshore Technology Conference, each year, World Pipelines’ April issue includes updates from oil and gas pipeline companies working offshore around the world. In addition to the issue’s general offshore focus, a number of companies are invited to participate in the annual Offshore Technology Review, which offers insights into global offshore pipeline activities. Read on to see what Aquatic Engineering & Construction Ltd. has (USA) been up to. "Aquatic Engineering & Construction Ltd. – offshore technology review"
Aquatic Engineering & Construction Ltd. (Aquatic) – a Acteon company – is an independent operator of modular carousels, reel drive systems and tensioner solutions for the global oil, gas and energy industry. The company is a global partner for complete lay solutions, delivering assured and optimised project outcomes through the provision of high quality expertise, equipment, reach and approach. While it is a member of DNV GL’s joint industrial panel for offshore equipment used for the laying and recovery of pipes and cables, Aquatic is also ISO 9001, 14001 and OHSAS 18001 certified. Aquatic can install, replace and recover semi-rigid products such as coiled tubing, flying leads, mooring lines, production flowlines, production gas lift and injection risers, reeled steel pipe, umbilicals and wire rope products, to name a few. With over 40 years of experience in onshore and offshore installations, transpooling, recovery and decommissioning works, Aquatic has a commitment to its customers – it customises its equipment and solutions to meet its clients’ needs. Aquatic’s equipment capability ranges from small winches to 11.4 m dia. reels, 3 - 50 t tensioners, a dual tensioner system with an 85 t line pull, powered reel drive systems with a ‘reel plus product’ capacity of 500 t, and the newest addition to the fleet, a 1500Te fully modular carousel system with a built-in tensioner. 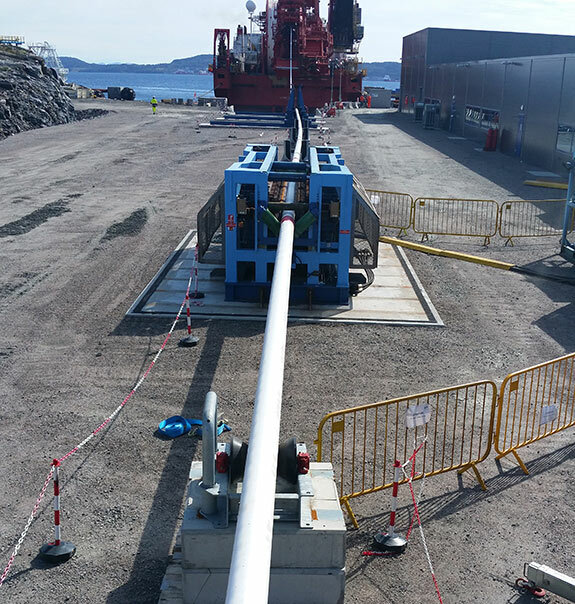 Tne example that highlights Aquatic’s attention to quality and its technical commitment to solving its clients’ needs with a tailored service, is a recent transpooling project the company completed at Gulen Base (Norway) for the Ivar Aasan project. Aquatic utilised its 20 t hydraulic tensioner, a horizontal caterpillar track system for the handling of flexibles, umbilicals and steel pipe. The tensioner was installed onshore (on the quayside) and spooled the product across to the vessel reel. The team transpooled two 16 in. lines of 10 km long, one 8 in. line of 10 km long and one 8 in. line of 23 km long. 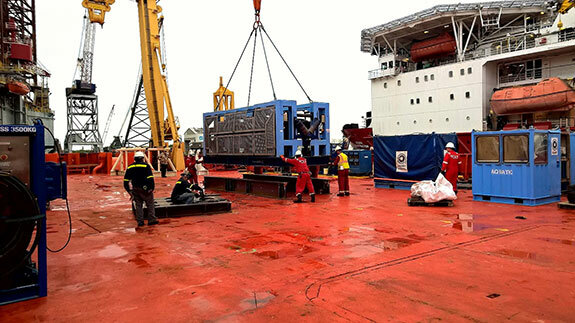 The service team, which was made up of four key personnel, managed and operated the tensioner while spooling the pipe to the vessel at speeds of up to 750 m/hr – an important feature when products have to leave the dock in a time sensitive manner. The transpooling operation was completed in an average of 24 hrs per product line, excluding the intermittent welding of the pipe prior to the pipeline being spooled to the installation vessel. The project was completed safely, professionally and without any incident. The team received complimentary feedback from the client for the equipment, personnel, engineering and management services provided during the campaign. Aquatic has grown its businesses and inventories across the world steadily. The company now has established offices and equipment located in each of its facilities, supporting the EMEA, Americas and the Asia Pacific region. Martin Charles, Managing Director, Aquatic, said: “The biggest challenge and biggest opportunity in 2017 for offshore suppliers both stem from the low cost pressures that they all face this year. In that low cost environment, the industry needs to ensure that safety and quality performance are maintained while at the same time sustaining high standard of service delivery to meet customers’ expectations. Additional information can be found on Aquatic Engineering & Construction Ltd.'s website.